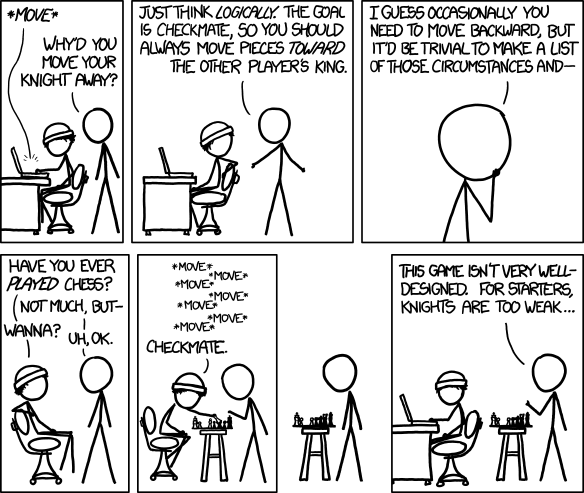 Mouseover text: "I've developed a more logical set of rules but the people on the chess community have a bunch of stupid emotional biases and won't reply to my posts." A very apt metaphor for scientific crackpottery. keithl wrote: The stick figure is looking at his own reflection while saying these things. Is this about a paired relationship, or the end of narcissism? It could be where he dumped the body. Inglonias wrote: I got the one for Germany, despite the fact that I'm in Northern VA. The airlift benefited Germany but was planned and authorized from Washington, DC; the comic connects those two places. I love that he started out by comparing (fairly) apples and oranges. feyayeruka wrote: My mother died in a Christmas Carolling accident. Not funny, not a good joke, not a good comic. And now I have that damn song stuck in my head! http://imgs.xkcd.com/comics/null_hypothesis.png Alt: Hell, my eighth grade science class managed to conclusively reject it just based on a classroom experiment. It's pretty sad to hear about million-dollar research teams who can't even manage that. There he goes again, preaching Null Theory. 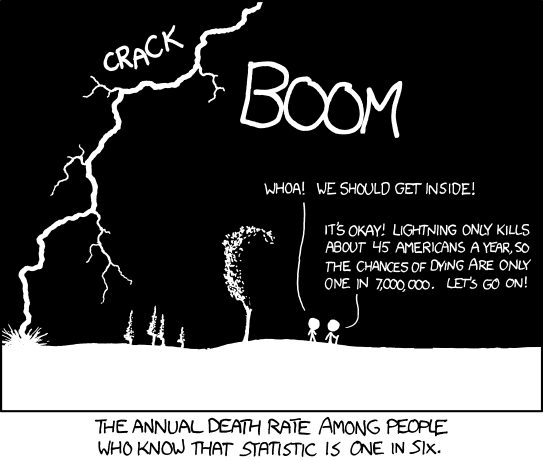 Andromeda321 wrote: The sad thing is I immediately thought upon seeing the second panel "wait, the axes aren't labeled!" Then I read the punchline, and yup, I'm a girl. Thus proving the last line of the strip. Nice deconstruction of positive-attitude sales. If there's a one-in-a-billion chance of it going wrong, you kill a handful of people on average. Nice adaptation of the word shibboleth. Title text: " 'Dude, wait -- I'm not American! So my risk is basically zero!' "
You can never discount observation effect when trying to assess statistics on humans. They're too clever for their own good as subjects. rwald wrote: Apparently this was my 111st post. I find that strangely appropriate. If I felt any resistance toward laughing at the current comic, it's that it didn't fully exploit the potential of the subject. I can still enjoy lukewarm cheese, though.